Paragon reverse gear is overhauled in 2015. Inspection hatch for propellor Inside the aft cabin. This motor cruiser is beautifully maintained and painted. Last drydock June 2018, four coats of Intertuff 203 International and two coats of antifouling Unipro International, 10 anodes changed for new. A list of maintenance with invoices is available, from on march 2010. Diesel wallace cabin heating (2012). The forward cabin is open to the living/kitchen. the gas cooker is mounted on a gimble. The 12V fridge (2016) , Isotherm Webasto unit. The pressured watersystem , Parmax pump with expansion tank. The entrance of this vedette is on port side into the wheelhouse/saloon, headroom 1.86m. The helm is on the port side. On starboard side a settee, facing the little tv corner and a settee seat on port side. Going down to the aft cabin, headroom 1.56m with two single beds of 0.70x2.04m, a wooden ward robe in the middle and under a cover the inspection hatch for propellor. Lot’s of storage under the beds. Going down the steps forward, a toilet room with manual toilet and washbasin, headroom of 1.92m. The kitchen on starboard side with seating opposite for four persons. This seating area can be set up as a single bed of 1.00x 1.90m. Forward, headroom of 1.92m is the double bed 1.30x1.80m, nice and airy with little windows fitted with musquito screens, as well as the hatch. Stainless steel Anchor chain locker. Dutch steel cruiser for sale in France. 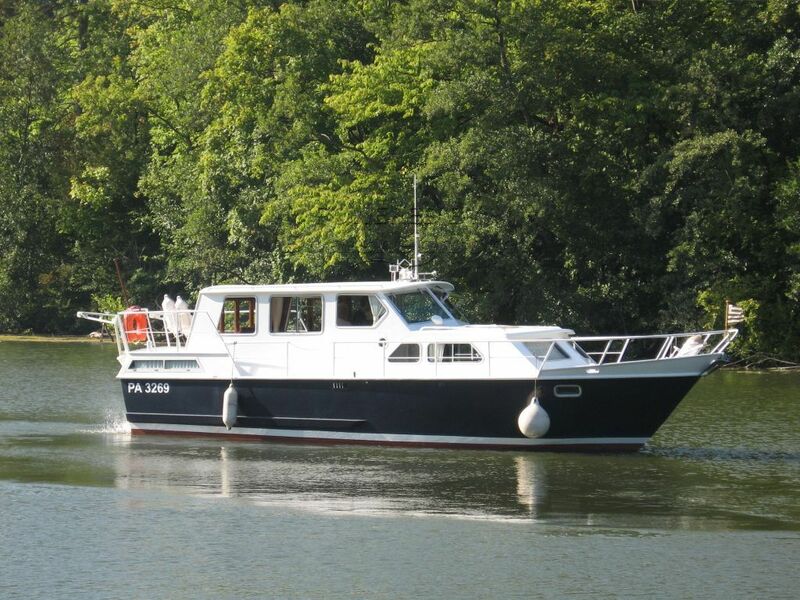 Boatshed Bourgogne is pleased to offer this 9.77m Dutch Steel Motor Cruiser for sale in Burgundy. Beautifully maintained, outside as well as inside, this comfortable little boat has a maximum storage space set out in a practical manner. A well made and very well looked after product. wooden doors and wooden panels are well protected from the elements. This boat has to be seen ! The boat is well insulated and has a total accessibility to all areas including the bilges. This Dutch Steel Motor Cruiser has been personally photographed and viewed by jacoba lagerburg of Boatshed Bourgogne. Click here for contact details.